Blogger has just announced the much awaited feature "Threaded Comments For Blogger" and you might have already seen it on your Blog if you are using a default Blogger Template. If you are using your own custom Template, then you will have to tweak your template for the threaded comments to appear. How to get the Threaded Comments ? 2. Use the Embedded Comment Form. 3. Now If you are not seeing the Threaded Comments, then it means that you have a customized template. There are different methods to fix this. But before doing any of those download a backup of your Template. 1. The simplest method is to reset each of your Widgets to default. Doing this will revert back any customization which you or the template designer has made to the Widgets. 2. If you don’t want to reset the widget templates, then you will have to manually Edit your template. Thanks for this. I found that blogger already inserted the correct lines in two out of three places, so you post was helpful for me to figure out where to edit. It is unfortunate Blogger does not spell out this detail when they release new updates. 1) it's good that google added "reply" function. Thanks! The code replacement was just what I needed to get it working. My problem now is the reply boxes are leaving the comment are and overlapping into my right sidebar. Do you have a suggestion for keeping it all in bounds? Thanks! Not in all blogs appeared this comments.. Especially in own templates. I have already comment box with 'Threaded Comments'. I tried it! But I couldn't find " " ..
@Natasha - are you sure that you expanded the widget templates? Thanks for the help. I tried the manual thing and it worked. The only problem I have right now is that the everything looks a bit disorganized: font type, etc. How do I go about fixing this? Thanks for posting! I hadn't noticed until I received your email update. I use a standard template so, glad to see that I can now respond to comments directly under them!!! Thanks! I got it but can I add back those numbering comments? I'm using "Simple" and there seems to be some coding already in for threaded comments, is it missing some coding since it's not showing on my blog? I don't like to amend it in case I mess up! can you help me modify it to get threaded comments??? I manually edited my template and it worked great! One problem... my comments now look like my blockquotes, and I don't want them to! How do I prevent that from happening? I've also noticed that when I pull up a post, it automatically takes the page down to the comments box. How do I stop that from happening?! Done it! Just had to enable embedded on the comment location! 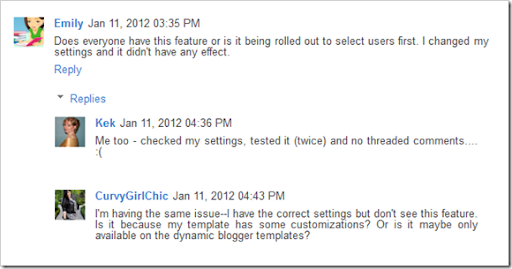 @Stacey - This is a known problem and the Blogger engineers are working on it. It happens only on Firefox and not on Chrome. I managed to get "reply" to show up on the blog but when I tried to click on reply nothing happened so I reverted back to pop-up window. my template html do have those code but still it doesn't enable the threaded comments? Does that have an impact? @Taufik Nurrohman - reset the blog post widget. Just like someone's comment, I see "reply" on the blog, but when I tried to click on reply nothing happens. What to do? check at W3C?...why I ask you? I did this - but the "reply" does not work. Any tips?? I have the same problem as vicky has. nothing happens when clicking on "reply" (or as my blog is in german: "antworten"). Hi- Thank you so much for the help. I got it to work, sort of. I have "reply" on there, but when you click on it, nothing happens. I am seeing that as a common question when I read the comments on here. Perhaps something we should bring up to Google? Just wondering if you have any suggestions. Thanks in advance for any help you can offer. @Beth - the threaded comments are still in development phase and this is a known issue. It happens mainly due to conflicts with other plugins(like twitter widget etc). Another known bug is the page being shown starting from the comment form. This is a cross browser issue. Hope the Blogger team will fix this soon as both of them have been already reported to the Blogger Engineers. Thank you so much for this tut. Test. It works here.. But not on my blog. I've done all the steps above to my custome template. Please tell me whats' wrong? Two others mentioned the problem I'm having. I have some custom template. And I was able to get threaded comments to appear. But the button doesn't work. The button next to it works and the Add a comment box at the end works as well. I have a custom template and after tweaking the code, threaded comments were working. But for some reason it has stopped working for the past 3-4 days. I didn't make any changed at all. You can see in here, for one comment I had replied using the threaded comments, now reply button doesn't work! Is there a way to tweak my customized template to get this feature to work? The reply and delete buttons appear below each comment but they don't work when clicked. I added threaded comments for custom templates but now it has suddenly stopped working. How do I get the default styles and comment form by Blogger? I didn't reset the widget templates. I fixed my template manually according to your procedure. Small success: there appeared "reply" links. BUT NOTHING HAPPENS when clicking on "reply". Can anybody solve this problem (does anybody knows a solution)? Thank you in advance for your accurate advice. My browser is IE 8.0.6001.19190. I see threaded-comments - added by bloggers probably by means of another browser (or configuration). That's a proof mechanism is active and is working. www.peaceandjoytoyou.blogspot.com for directing me here on the google forum. Thanks worked for me but after debugging a lot. Had to revert back to widget defaults on another blog using the same template then changed the comments part. The new template I downloaded already came with this script. But for some reason, the comment box doesn't open. Could you help me? Hi- I'm having a little problem. I don't want to reset the widgets as I had my blog designed for me and don't want to stuff up the coding- but I can't find any instances of to replace in the coding. I fixed my template manually according to your procedure. There appeared "reply" (Odpowiedz) links, but absolutely nothing happens when clicking on "reply". The second option worked a treat. Thaanks! I tried your method but it doesn't work. I can't see my comment form displayed. What happen was that I put Facebook Comments to my blog and hide the original blogger's comment. Then when I switch to dynamic views template, my Facebook comments does not work. So I wanted to switch back to use blogger comments, but it still does not show up even after I've reset the template to the original one. In your second options I could not find the in my coding. i already replaced the code, but no use!!! I have tried the revert and it did not work. I also was not able to find the <B:language to replace with your new script.